TORONTO • Rap star Drake, Toronto Raptors' most famous cheerleader and chief trash talker, could well claim the "sixth man of the game" award for their 130-119 National Basketball Association (NBA) play-off win over the Washington Wizards on Tuesday. Not satisfied with killing the Billboard Hot 100 charts, he predicted the same with the Wizards, taunting opposition star guard John Wall with a video on Instagram stories from the sidelines: "John, you're getting bodied by 20 tonight." While his accuracy was off the mark, the result was not. Drake's presence rubbed off on the hosts, who lead 2-0 in the Eastern Conference first-round series. Game 3 is in Washington tomorrow. Top of the Wizards' rap sheet would be the broken defensive plan that led to their 106-114 Game 1 demise. On Tuesday, they were left bewildered by the offensive spell of DeMar DeRozan, who had 37 points as Toronto broke a franchise record for points in a play-off game. 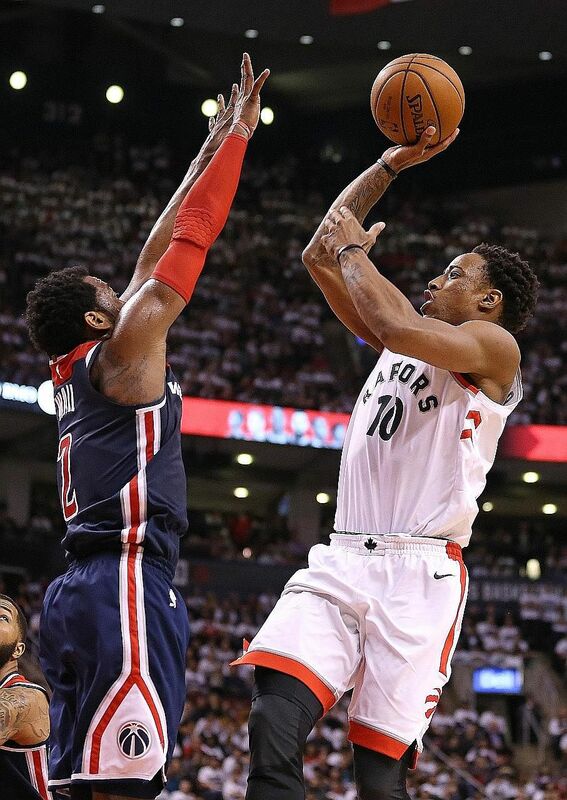 They allowed seven three-pointers and an opponent-season-high 44 points in the first quarter, powered by DeRozan's 13 as he matched his play-off scoring high. By half-time, the top seeds in the East, who soared to a 23-point lead, had totalled 76 points, another post-season franchise record. 6 Players each from the Raptors and the Wizards who scored in double figures. Though it came down to 113-108 in the fourth quarter, the Raptors had the last laugh - a 19-4 run to restore the lead back to 20 points with 2min 33sec left. Wall recorded 29 points to pace the eighth seeds, while Mike Scott scored 20 and Kelly Oubre Jr, who was also subjected to "bum" taunts by Drake, added 14 as Washington were out-rebounded 48-34. "We did what we're supposed to do at home. We haven't done nothing yet," DeRozan said in a post-game interview on NBA TV. "We got to go out in their place for Game 3 (at Capital One Arena), and it will be a much tougher game, and that's where we can make something happen." His team-mates Jonas Valanciunas contributed 19 points while C.J. Miles added 18 points and Kyle Lowry had 13 points. In Boston, Jaylen Brown had a play-off career-high 30 points as hosts Celtics took a 2-0 lead in their Eastern Conference first-round series with the Milwaukee Bucks after a 120-106 win on Tuesday night. He eclipsed his previous high of 20 in Sunday's 113-107 overtime victory in Game 1, while Terry Rozier finished with 23 points and Marcus Morris had 18. Giannis Antetokounmpo had 30 points and Khris Middleton added 25 points for the Bucks, who hope to avoid their fourth first-round play-off exit in six years. In the Western Conference, Jrue Holiday scored 33 points, Anthony Davis had 22 points and Rajon Rondo collected 16 points as the New Orleans Pelicans downed hosts Portland Trail Blazers 111-102 to seize a 2-0 lead in their first-round play-off series. C.J. McCollum scored 22 points and Damian Lillard added 17 points for the third-seeded Trail Blazers, who will now travel to the Smoothie King Centre for Games 3 and 4 in their best-of-seven series.